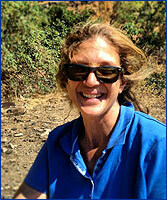 Lina Tsingerlioti lives in Ikaria and has been leading visitors to the island on hiking & walking tours since 2008. Safety is her highest priority and she has expert knowledge of Ikaria's mountains, network of trails & paths, terrain and nature. She holds a Bachelors Degree in Tourism & Hospitality, a Masters Degree in Environmental Policy and Management and is a qualified guide of Mountain Protected Areas, including the EU Natura 2000 protected areas of Ikaria. 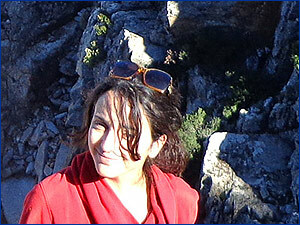 She has also completed Greece's School of Mountaineering (ERA) first level studies and is a member of the Ikarian Association of Mountain Hiking (OPSI ). She is an active volunteer in monitoring, marking, maintaining and safeguarding Ikaria's vast network of paths and trails. Lina has also completed various seminars and training programs on herbs, environmental education, beekeeping, rural tourism and processing of agricultural products. Going on a hiking or walking excursion with Lina as a guide is aa enjoyable rewarding nature and learning experience owing to her in depth local knowledge and professionalism. George Karastamatis is a seven year veteran of Greece's biggest outdoor activities company - Trekking Hellas. 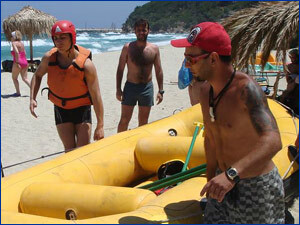 During his tenure at Trekking Hellas he worked as a white water rafting and kayak instructor and group leader. He is also a snowboarding instructor in the winter months and founded Greece's first surf and paddleboard school which was based in Ikaria. In addition to his many years of experience as an instructor and guide for multiple outdoor sports & activities, he is also a recognized national & regional athlete, having won numerous gold and silver medals in boxing and Tae Kwon Do, and having competed in boardercross. George leads and guides tours and activities and resides permanently in Ikaria and is qualified lifeguard and trained in first aid and water/mountain rescue. Kostas Pamfilis is a qualified and licensed captain of sailing and power boats and owns a 44 ft professional charter sailboat that during the summer is based in Faros. Together with his parents, brother and sister, he also owns and operates the Kaisi Hotel Studios on Faros Beach. The family are long time residents of Faros, going back to when the village was only accessable by sea. Kostas is also a certified diesel mechanic and is an officer at the Porto Rafti Yacht Club south of Athens. He lives seasonally in Faros together with his wife, two children and immediate family. Thea Parikos owns a loca guesthouse and restaurant and is a specialist in traditional Ikarian cooking. Over the years she has led cooking lessons at her restaurant and had the pleasure to host and introduce many visitors to Ikaria and the Ikarian way of life, including best selling author Dan Buettner of Blue Zones. Mr. Buettner, together with his the National Geographic & CNN teams, were hosted by Thea while filming, studying and writing about the island, the Ikarians and their way of life. Born and educated in the United States and of Ikarian decent, Thea moved back to Ikaria with her husband Ilias in 1994 to open and run the family business. Ilias was born in Ikaria and is an accomplished organic farmer and wine maker. His nearby farm supplies the always fresh meats and vegetables and delicious wine for their restaurant. 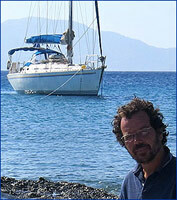 Peter manages Island Ikaria Activity Tours and leads tours and activities. Born and educated in America, he holds an MBA and is of 100% Ikarian decent. An avid sportsman, traveller and entrepreneur, Pete has a broad professional background, having worked in Tourism, Yachting, IT, Finance and Real Estate Development. He lives most of the year at his home in Ikaria and participates in many outdoor sports & activities including: sailing and yacht racing, snowboarding, kitesurfing, scuba diving, kayaking, mountain biking, hiking and tennis. He is a qualified sailing yacht captain and skilled kayaker and is certified in First Aid/CPR/AED from the American Red Cross.